Last month, an image circulated online of a small, lifeless boy in shorts and a t-shirt, face down in the surf at a beach in Turkey. He was the 3-year-old son of Abdullah Kurdi, a Syrian barber who was attempting to flee his war-torn country with his family to Europe, and then to Canada. The rubber raft they were taking across the Aegean flipped, and Kurdi’s wife and two children drowned. Thanks in part to tragedies like the Kurdis’, the scope of an ongoing refugee crisis in Europe now is well-known. Four million Syrians have fled their country, and hundreds of thousands of refugees from the Middle East and Africa have also have left for Europe. For those who survive, the journey across the Mediterranean is only the start of the challenge. Some European nations are refusing to take in refugees, even though they’re obligated to do so under international law. Millions of people have been left in limbo as a result, searching for ways to build new homes. How should the world step in and help refugees from Syria and other nations? How can Europe better accommodate those in need, and what can other countries—including America—do to help? In advance of the Zócalo/Democracy International/NPR Berlin event What Can the World Learn From Europe’s Refugee Crisis?, we asked a group of migration and human rights experts: What can governments, humanitarian groups, and rights organizations learn from Europe’s refugee crisis? The intensity of this crisis is matched by the breadth of lessons it offers. First, we should understand this as the Syrian (and not European) refugee crisis: Nearly 4.2 million people have fled the violence in Syria, but “only” 10 percent have fled to Europe. The majority has sought refuge in neighboring countries. As with most crises involving migration, mass exodus within the developing world generally fails to prompt the same response from the West as crises that affect Europe directly. We can’t consider this crisis only to the extent that it affects Western Europe. On a broader scale, the Office of the U.N. High Commissioner for Refugees estimates that there are 59.5 million people fleeing violence and persecution worldwide. Even if European states develop and implement robust and coordinated responses to the Syrian crisis (a big “if”), tens of millions of people fleeing violence and conflict will remain largely abandoned. The Syrian crisis has forced some attention on global refugee issues, but much more is needed. 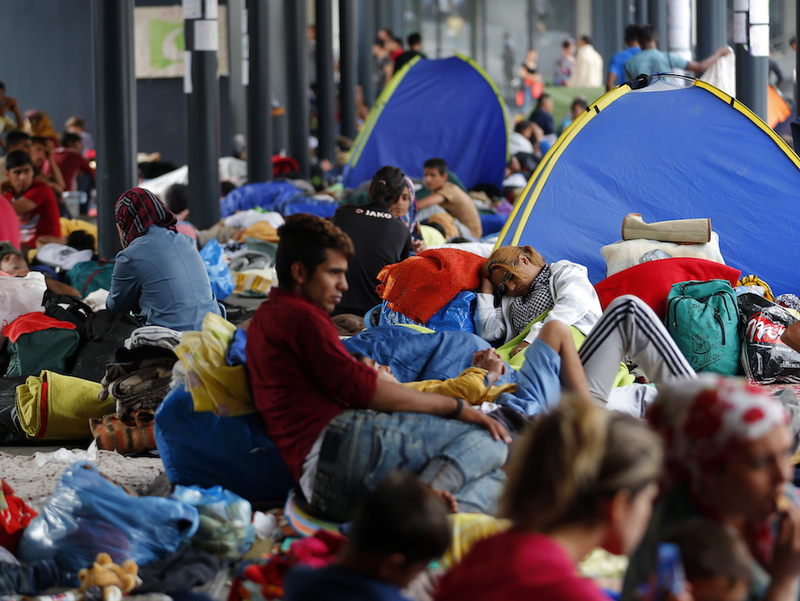 The growing number of refugees suggests that the current global architecture is not working. When one considers the massive migrations that will almost certainly result from unchecked climate change over the course of this century, combined with flight from conflict and economic hardship, the failure of the status quo becomes clear. Instead of closing borders, criminalizing human population transfers, and building border fences, we should rethink existing frameworks. As U.N. Special Rapporteur for Migration François Crépeau has suggested, the global community would be better served by regulating, rather than criminalizing migration. Public pressure has been critical thus far in demanding ethical responses from European and other world leaders. Perhaps the most important lesson of all: Concerned citizens must continue to demand the comprehensive political and humanitarian responses that this global crisis requires. James Cavallaro is a professor of law at Stanford Law School and first vice president of the Inter-American Commission on Human Rights. 1. Containment does not work. Restricting the refugee crisis to the Syrian region is unsustainable. Figures from the Office of the U.N. High Commissioner for Refugees show that there are more than 4 millions refugees from Syria in Egypt, Northern Iraq, Jordan, and Lebanon, and the United Nations has appealed for $4,533,248,258 to assist them. But to date, only $1,839,058,956 has been received. Pledges have not matched actual donations, and the U.N. is experiencing a 59-percent shortfall. 2. Without legal protection, people will move. With no protection from being sent back, refugees have no possibilities to work legally, so more will decide to leave neighboring host countries and create a more dispersed family or social network. Germany and Sweden will remain the two most popular end points in this onward forced migration. Furthermore, Russian air bombardment in Syria will now push even greater numbers to escape; this new displacement will most probably be directly to Europe via smugglers. 3. Refugee families are desperate to educate their youth. As the humanitarian crisis in Syria enters its fifth year, many families despair that their children—many who have been out of school for three to four years—are becoming a lost generation. Increasingly, these families are pooling the last of their savings or going into debt to pay smugglers to take young refugees to Europe, where they have a chance of applying for asylum or humanitarian leave to stay long enough to access Western education. Providing scholarships for refugee youth in Western schools and extending work-study programs in Turkey, Lebanon, and Jordan would help give young people the tools to rebuild Syria with new democratic values and aspirations. Dawn Chatty is emeritus professor of anthropology and forced migration at the University of Oxford. She is the former director of the Refugee Studies Center. Contrary to how it is often framed, the actual refugee emergency is not the outcome of any dramatic change in refugees’ strategies to enter the EU, nor does it originate from an exceptional increase of the number of refugees attempting to reach Europe. The Balkans have been among the major routes for unauthorized entrance into the EU for more than a decade. Undocumented border crossing is a scarcely detectable practice, and some of the growth in numbers comes from the tightening of border controls between Hungary and Serbia. Yet even with today’s available technologies, there is no feasible way to secure a border. In Hungary, after hundreds of miles of its border were fenced and thousands of officials deployed, refugees just started crossing somewhere else. Almost all the people who cross Europe’s external border without the necessary documents are refugees that have the right to apply for asylum in the EU. They make such dangerous journeys because it’s almost impossible for them to get a visa or permit to safely travel there. The most effective way to solve this “crisis” is thus to create legal frameworks to allow safer and cheaper journeys to Europe—for example, through humanitarian corridors. There is no evidence that this would create a pull factor: Macro data demonstrate that refugees tend to remain close to their countries, relatives, and friends. What institutional and non-institutional stakeholders could learn from the “crisis” is that more grounded evaluations are pivotal for the development of good policies. Unfortunately, governing through a permanent state of emergency seems to become increasingly frequent in Europe—take, for example, the Greek crisis. Thus, empirics are not enough: Good data must combine with the political will of relying on them in order to set policies. Giacomo Orsini is a lecturer on international migration at the Institute for European Studies of the Université Libre de Bruxelles. He has conducted fieldwork in Morocco, Malta, and Melilla on how the EU external border and migration regimes work on the ground. Today, more people are on the move than ever before; one in seven people is a migrant. Migration is desirable and beneficial—as long as it is voluntary, orderly, and humane. But conflicts are forcing millions of people to flee their homes. Governments need to manage migration in a comprehensive and coherent way, addressing both immediate and longer-term aspects. International cooperation is a must to more effectively protect migrants and safeguard their rights and dignity. The migrant situation in the Mediterranean teaches us that Europe should truly stand for its own history. The organization I represent, the International Organization for Migration, was established in the wake of World War II to resettle displaced Europeans. It is encouraging to see Europeans these days hosting welcoming receptions and standing up for migrants and refugees by lobbying their governments to adopt humane policies. Hopefully, this momentum will continue. After all, historically, migration has been overwhelmingly positive. It can help address population imbalances, and be a catalyst for positive economic and social changes in the context of fast-paced globalization. The flow of migrants and refugees to Europe will continue to increase unless we address the root causes of forced and irregular migration. International cooperation along migratory routes and at destinations is only one aspect. Governments must work together to foster peace through viable political solutions to current conflicts, and by supporting global economic development. Migration is not a problem to be solved; it is a reality to be managed, which promotes the safety and dignity of migrants. The challenge is to switch from poisonous to positive discourse and create conditions where migration is beneficial, not seen as a liability. Ashraf El Nour is the International Organization for Migration’s Permanent Observer to the United Nations. The European Union recognizes that “interdependence” is the key word of the modern world. In trade, mobility, and security, cross-sector, cross-border, and trans-continental cooperation is a must. Last month, European Commission President Jean-Claude Juncker called for reform of various immigration policies in the EU and for European states to accept binding quotas to resettle 160,000 refugees. Yet, there are still no concrete proposals regarding the role and responsibilities of countries outside of the EU to “share the burden” of accepting refugees and migrants. Considering that there are many more to come from Syria alone, and also that more than 2.5 billion people live in oppressive regimes across the world, it is clear that any real policy solution has to focus on the root of the problem. Social tensions are rising in Europe. The absorption of such a large number of ethnically and culturally diverse refugees is an exercise that has put our basic human values to the test, and could lead to resentments about rising crime, loss of national identities, and dubious religious concerns. If there is anything we should learn from this crisis, it is that people’s fears need to be taken seriously, and that public debate, transparency, and inclusive policy-making are still the best way to address global challenges. In the years to come, the EU will have to embrace its neighbors in its policy-making and strategic thinking. It will also have to develop integration policies in cooperation with think tanks, academia, and human rights groups, along with organizations like the U.N. and the Red Cross. And it will have to address a growing populism and xenophobia that have resulted from territorial expansion. This will require a fully coordinated approach. Gordana Delic is a director of the Balkan Trust for Democracy, a project of the German Marshall Fund that supports democracy, good governance, and Euroatlantic integration in southeastern Europe. *Photo courtesy of REUTERS/Laszlo Balogh.